Unpack the content of the archive pcwPatchLoader-en1.2.zip into any empty directory and then run the pcwPatchLoader.HTA. In the dialog box, click on the button ">>", and select the folder where the updates and the service packs are to be located. You will probably be using this folder for a while, so make sure that sufficient space is available on the partition (1 GB is recommended). Also, make sure that the folder is not located on the system partition. In the following step, the software checks what critical updates were already published for the currently running system. 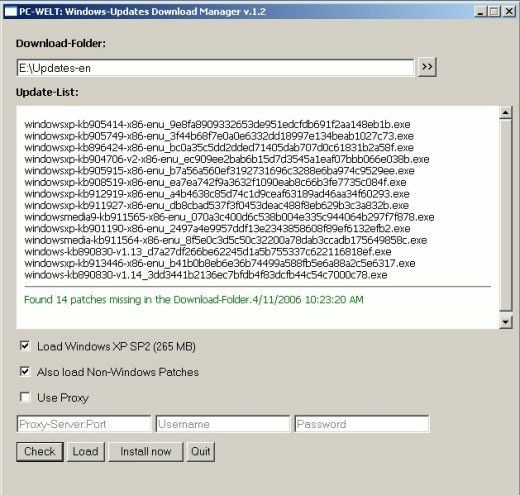 Then it checks and compares if those updates already exist in the target folder, before listing the missing ones in the "Update List": Via the click box, you can decide if you – additionally - want to download the current service pack. If you already have the required setup file, just copy it into the update directory. Since an up-to-date service pack contains all critical updates created right up to the pack’s release, you cannot skip this step. 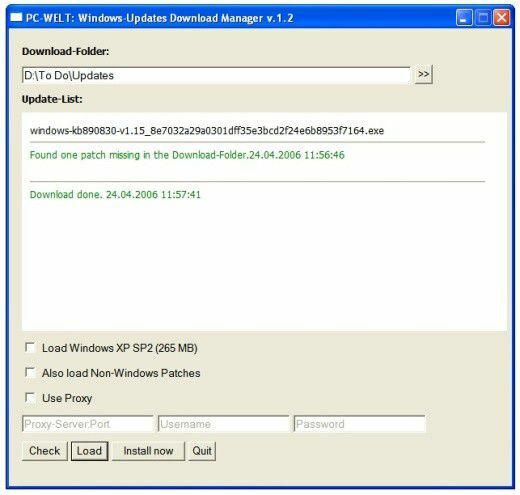 In the tool, please click on "Load", a step initiating the download of all listed updates and of the service pack.